Tweedholm Avenue East in Walkerburn. A Polish painter and decorator has been jailed for 10 months for setting up a cannabis farm made up of 244 plants estimated to be worth £24,000 altogether. A police raid also discovered that the electricity meter at Jacek Kedziora’s flat in Walkerburn’s Tweedholm Avenue East had been bypassed. The 47-year-old pleaded guilty at Jedburgh Sheriff Court to charges of cultivating cannabis and bypassing the electricity supply between April 30 and July 9 last year. A not-guilty plea to being concerned in the supply of cannabis was accepted by the crown after Kedziora insisted the drugs were for his own personal use. Sheriff Valerie Johnston told the first-time offender: “This cultivation seems to have been a very professional one. 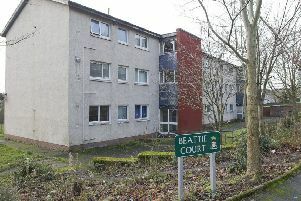 Procurator fiscal Graham Fraser told the court: “In June 2015, one of the accused’s neighbours contacted the local council’s anti-social behaviour unit to complain about the constant fan noise coming from the property. “The officers got involved, and the accused contacted the lady and said he had a noisy fridge and it would be sorted. “However, it was not sorted, and she suspected something was not right and contacted the police. “In July 2015, the police obtained a search warrant, and police officers went into the property, where they found one of the bedrooms had been turned into an area of cultivation and a second bedroom was a storage area. “The rest of the flat appeared normal and lived in. “A total of 244 healthy plants were found in the premises. All of these were a foot to 18 inches high. “There were lights suspended from the ceiling, and the windows were blacked out. “There was a filter system in operation, with the smell from the plants going into a sealed cupboard. “The electricity meter had been bypassed with bare wiring coming out of the meter. “Scottish Power had to attend to make the power safe. Mr Fraser said other drug-growing equipment was recovered too. Defence lawyer Fiona Hamilton said Kedziora had made an impulsive decision to grow his own cannabis and had been given the equipment by friends who had since left the country. Ms Hamilton said Kedziora lived in the flat himself but sends money home to his two children in Poland. Since his arrest, he had been living with his sister in Measham, Leicestershire, and had been unable to visit his family as he’d had to surrender his passport and identity card, the court heard. Ms Hamilton urged the sheriff to impose an alternative to a custodial sentence. Sheriff Johnston also ordered that the drugs equipment and cannabis plants be forfeited.